It seems that every ten years or so, a new or reintroduced style comes onto the scene in the world of mens suits that simply turns everything else on it's head. Read on and you will learn how not all suits fit the same. About a year ago if you were paying attention you started to see Male celebrities wearing these Modern Fit Suits that made other mens suits look like fabric boxes and look totally out of touch with the times. The modern fit suit seems like it started in Europe and was seen on the likes of famous people like David Beckham and Justin Timberlake. The sleek looking style and silhouette of modern fitting suits would instantly slim the look of the man wearing them giving them a truly tailored fit that let's face, you just don't see on your average looking single breasted suit. Now, don't think you need to be a celebrity like David Beckham or Justin Timberlake to wear a modern fit suit because the only thing you need to do is be in decent shape and have the swag necessary to wear one. Remember that confidence is King when it comes to wearing any suit and looking great and a modern fitting suit is no different especially if you favor Stacy Adams Shoes. Check them out and remember that once you get yourself one, you will be coming back and getting more because you are going to love the way you look when you're wearing one. If you need a Summer suit, take a look at our selection of Linen Suits for men. In case you've been sleeping the past two years a modern fitting style suit is a single breasted suit that usually comes with a 2 button jacket but has also been made in a 1 button jacket as well. 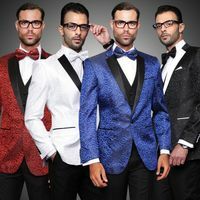 What you'll notice immediately with modern fit suits is that they are tailored fit and have slimmer narrow lapels that can either be notched narrow lapels or peaked narrow lapels for a more European look. 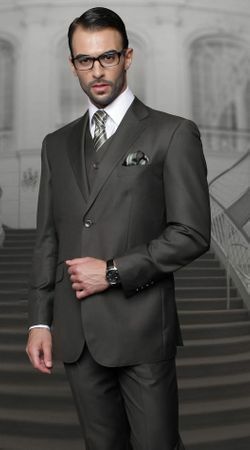 The modern fit suit is also generally one inch short in the jacket length where your more conventional fitting single breasted suit is 32 inches long, the modern fit suit is 31 inches long which gives the suit a much more modern look. 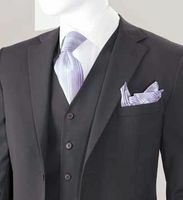 This style of suit has also been made famous on the hit TV series "Mad Men" which takes place during the early 1960s when you would have first seen suits of this style around. Don Draper is almost exclusively wearing nothing but these narrow lapel modern fit suits on the show giving off a sense of style that most men would just love to have.